The Amish are famed the world over for their solid wood rocking chairs, and this exceptional example - scaled down to a size that's perfect for the family's newest members - carries on their traditions in fine style. The Lancaster Legacy can trace its heritage back to the earliest days of Amish culture, with its timeless design and heirloom-quality solid wood construction creating a level of integrity and durability that just isn't seen elsewhere in the modern world. This kids' rocking chair wants to become a true part of your family's story, offering generations of kids, grandkids, and great-grandkids a safe and comfortable place to relax. Your Lancaster will be handcrafted to order in oak wood and then finished with your choice of stain, varnish, or paint treatment. The woodshop that crafts these pieces also welcomes custom orders - if you would like to chat with us about having the woodworkers craft you a completely unique Lancaster, please reach out to our team by phone or by email at any time. We love this effortlessly traditional piece, and we would love to talk with you about the warmth and happiness it brings to the family home. 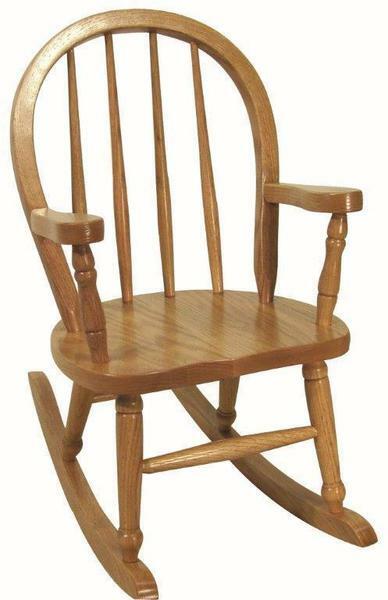 This kids' rocking chair can be shipped to any location in the continental United States for a flat rate of $50. Seat Width (Top of Arms): 15"